What Happens If I Don't Pay My Student Loans? 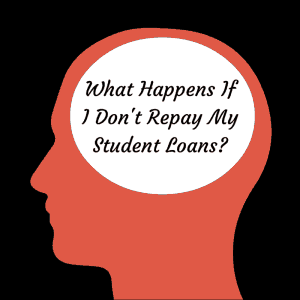 Home » What Happens If I Don’t Pay My Student Loans? What Happens If I Don’t Pay My Student Loans? I was reading an article yesterday about how 13% of student loan borrowers don’t even consider their student loans to be debt. Crazy? Well, if that didn’t surprise you, it probably also doesn’t surprise you that 13% of all student loans are in default. That means people are not paying their student loans. That works out to 7 million student loans that are behind an average of $14,000 each. So what happens if you don’t pay your student loans? Honestly, it’s one of the worst financial moves that you could ever make. And while you won’t go to a debtor prison, you’ll likely find yourself in an emotional and financial prison. Let’s break down the process of what happens if I don’t pay my student loans. Your loan technically goes into “default” after not making a payment on the loan for 270 days. For a typical loan, you have a billing date, and then a 28 day grace period to make the payment – the real due date. For example, if your billing date is 1/31, you have until 2/27 to make payment of your monthly payment in full. If you don’t make your payment, your loan goes into delinquency status. This also happens if you don’t make a full payment. Once you are delinquent on your loan, your lender will attempt to contact you multiple times. You’ll typically get a 30 days past due reminder, a 60 days past due reminder, and a 90 days past due reminder. You’ll also likely get several phone calls from your lender as well, to check in and see if you plan on making payment. Even if you make partial payments, until you bring your total student loan account back into balance, you’re still considered in delinquency. After 90 days of being late on your payment, your lender will typically report the delinquency to the credit bureaus and give you a final reminder to make payment. After 270 days of not making a payment, your loan is in default. At this point, it will typically be transferred to one of the many student loan collection agencies. If you still don’t pay, your school, the financial institution that made or owns your loan, your loan guarantor, and the federal government can all take action to recover the money you owe for your student loan debt. If you default on your student loan, the consequences are not good. Beyond ruining your credit score, there are a lot of ways that your lender will try to collect the money. With all of these, your student loan debt could end up costing you a job, a place to live, and more. If you are having trouble paying your student loans, you should immediately contact your lender. There are a lot of options that could help you, all of which are better than just not paying your student loans. First, you should look at changing your repayment plan to something more affordable. You could switch to IBR or PAYE, which are income-based plans that could put your payment at $0 if you qualify. Second, if you are having a temporary hardship, you could ask to have your loans put into deferment or forbearance. This will give you a little time to regroup without having to make payments. Remember, interest will still accrue, but you won’t be required to make payments. Finally, check to see if you qualify for any type of student loan forgiveness program. If you don’t qualify for a traditional student loan forgiveness program, you could switch repayment plans to one that includes student loan forgiveness. It’s important to remember that, even if you don’t pay your student loans, the government or your lender will always get their money for your loan. That’s because they can garnish your wages and taxes to make sure that they get paid back. According to the 2013 Department of Education budget, after the federal government pays collection agencies to recover the loan, the government is likely to recover about 96% of what the borrower owes. Do you see that – so even if you don’t pay your loan back, the government, AFTER paying a collection agency, still gets back 96% of what they were owed. You cannot escape your student loans, and not paying them is not the answer. Have you ever considered ditching your student loans? What steps have you taken? So many people fail to contact their lender when they’re unable to pay their bills. I think that lenders want to get their money and will generally at least try to work with the people if they get a sense that the person truly does want to pay. The ones that ruin it are the ones that actually do contact the lender but do it only as a stalling tactic, and have no intention of paying anything.